The Comfort Food lesson was designed to help students make a personal connection to the civil rights movement and to recognize that people, just like themselves, came together as a community to fight against the injustices of segregation and discrimination. The use of food in the story helps students to identify with the civil rights activists, unified by a common goal and engaging in the common practice of fellowship over a meal. This activity has been implemented in a variety of classrooms with much success. Students enjoy choosing their favorite foods to add to their menus and delight in inventing creative names for their foods. They are challenged to demonstrate writing skills, practice alliteration and identify adjectives, as well as recognize food group. The students especially enjoy experimenting with a variety of art materials to create their own plates of food. The primary goal of Comfort Food is to inspire future social activists. As the students write their menus and design their plates they are guided to view themselves as activists who must strengthen themselves and others to fight for justice and equality for all. To recognize the role of community in social activism. To make a personal connection with civil rights activists through family and food. To identify food groups to create a menu. To use alliteration to name menu items. To describe foods using adjectives. 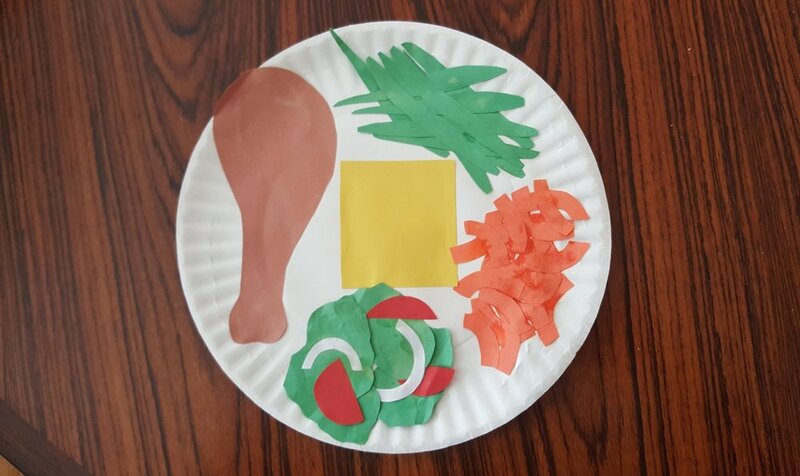 To create a plate of foods out of various materials. Sample menu handout. View Sample Menu (PDF) and download the Menu Template (PDF). Discuss what the little girl observed from under the table. Ask students about their family time, dinner, favorite foods, family members, or extended family to stimulate discussion. Help students make personal connections with the family in the book. Ask students what the people in the book were planning and what they were doing as they planned. Encourage students to recognize that the food helped to strengthen them for their civil rights work. You may want to reread the lines, “No matter how many people came to dinner, there was always enough to go around, enough to strengthen, enough to comfort the family of the civil rights movement” and ask students what it means. Explain that they will write a menu of foods that will strengthen and comfort them to fight for what is right. Tell students to think about their favorite foods, foods that will make them feel good and make them strong. Remind them that it is important to have foods in each food group and guide students to name the four food groups, listing them on the board. Introduce the concept of alliteration by explaining that writers sometimes use words that begin with the same letter to make it sound more interesting. Ask them to think of describing words or adjectives that start with the same letter as the food to make their menu sound more poetic. List adjectives as a class that could be used to describe foods. Model writing a menu with the class or share the completed sample provided. Explain that when they are finished writing their menus they will create their meals using the art supplies provided by drawing, cutting, and gluing them onto a paper plate to represent the foods. Demonstrate how to make a few foods, such as using green pipe cleaners for green beans, balling up yellow tissue paper to make corn, or using cotton balls for mashed potatoes. Or you can show the students a completed sample as a model and describe what you did. Instruct students to begin writing their menus and circulate around the room to help them get started, sound out words, or come up with alliterations and clever menu items. Ask students to share unique ideas aloud to inspire others. Note: You may want to allow students to dictate their menus or write a master menu as a group and have students copy the items of their choice. Summarize lesson by complimenting students on creating menus that will strengthen and comfort them when they are working hard to help others and making sure that everyone has equal rights. Remind students that it is important to eat right, especially when fighting for justice. Share completed menus and plates when students are done. Paula Young Shelton is the author of Child of the Civil Rights Movement and a first grade teacher in Washington, D.C.